This week we welcomed a lovely group of Brazilians into the Elebaires family for a one week Spanish program. 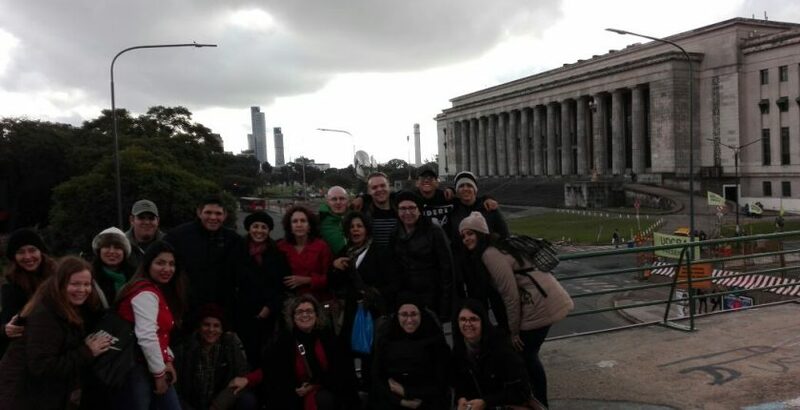 They came to Buenos Aires eager to learn Spanish and experience what we have to offer. Due to Brazil’s close proximity to Argentina, many of them already knew some Spanish, while others were just beginning. However, even though Brazil and Argentina are close, they speak very different languages. Portuguese may look similar to Spanish on paper, but the sounds and pronunciation have many large differences. 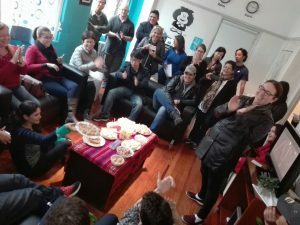 The brazilians were excited to learn about Buenos Aires culture, but they were also eager to show us a bit of theirs too. On Wednesday, they brought several sweet treats from their home country to share with all the other students and staff. They each stood up and introduced what they brought. It was an amazing experience that brought all the different cultures in the school even closer together. Many of the sweets they brought were made with peanut, marshmallow, or pumpkin! 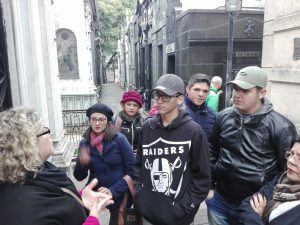 After class and the food presentation, we hopped on a bus and took the group of Brazilians to Recoleta. We began our afternoon activity at the cemetery. Laura gave everyone a history lesson as we walked through the rows of extravagant tombs. The Brazilians were amazed at the details and size of the world renowned Cemetery. After the Cemetery, we walked to the Recoleta Church. Some prayed while others took pictures, but despite religious differences, everyone still agreed that the Church was an incredible sight. From the church, we walked up to the Florias Genica and we explained to them how it opens at sunrise and closes at sunset. Many of them took Selfies in front of the giant flower, while others rested on the reclined park benches scattered around the park. Despite weather reports of rain earlier in the day, the sun was shining and the weather was warm. It was a beautiful afternoon for sharing cultures.